"Ammodara rooms" would like to introduce you to the beautiful island of Naxos, which is situated in the centre of Aegean Sea, in Cyclades. Ïur rooms are located at the southern part of the seaside resort of Aghios Georgios (St. George), which is the main beach of Naxos Town (Chora). "Ammodara rooms" offer nice and quiet accommodation near the beach, where you will enjoy unforgettable and sunny holidays in a friendly and hospitable atmosphere. All our visitors enjoy here the feeling of living close to the nature. Since July 25th, 2010, a brand new pension “Maria’s Rooms & Studios” has opened. It is beautifully located just 50 metres from Maragas Beach. Maragas is a beautiful, very long sandy beach and has crystalline turquoise waters. 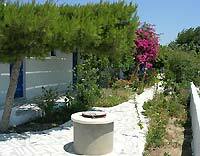 It is situated between the beaches of Agia Anna and Plaka, 7-8 kilometres distance from Naxos Town. 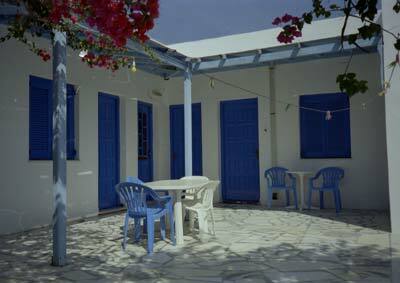 The family environment and tranquillity will make your holiday on Naxos an experience hard to forget. The pension consists of 8 rooms (6 double and 2 triple rooms) which are distributed sparsely over two floors. Each of our rooms is fully furnished and equipped with Air-Conditioning, TV, refrigerator, kitchen and has a private bathroom. The private balcony offers views towards the sea.